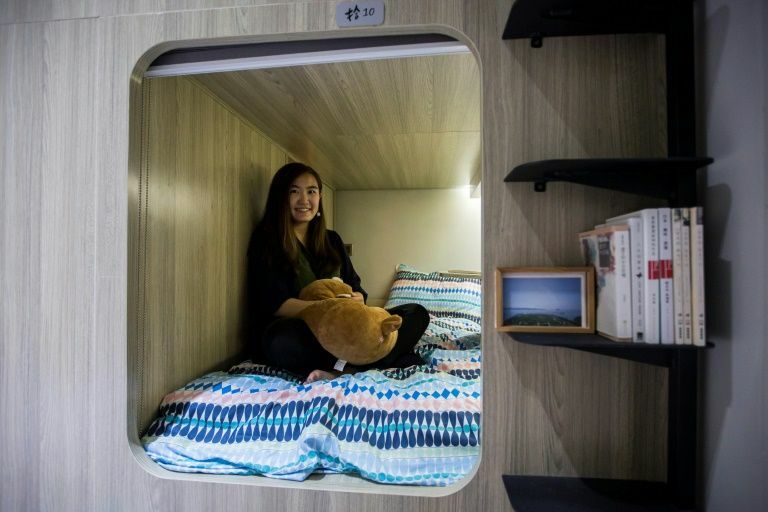 HONG KONG: As housing prices spiral in Hong Kong, young professionals are living in ever-shrinking spaces, with box-like “nano-flats” and co-shares touted as fashionable solutions. Blocks of sleek miniature apartments packed with mod cons are springing up around the densely packed city, pitched as an attractive and more affordable lifestyle choice, but still at an eye-watering cost. Finance worker Adrian Law, 25, paid more than HK$6 million ($765,000) two years ago for his tiny studio apartment in a new development in the gentrified Sai Ying Pun neighbourhood. The slim glass building squeezes four apartments onto each floor and includes “nano-flats”, a new term for homes of under 215 square feet (20 square metres). Law’s studio is a fraction bigger at 292 square feet, with a price per square foot of nearly HK$20,000. He has adapted to the limited space by buying transformable furniture — his bed folds away against the wall to reveal a desk tucked underneath — and he keeps most of his belongings at his parents’ home. “Property developers are marketing the concept to buyers that they only need a place to sleep and can do anything else outside,” he told AFP, admitting he eats mostly take-away food as the kitchen is too small for cooking. Law’s parents helped him put down a 30 percent deposit when he bought the apartment and he sees it as an investment. He pays HK$24,000 per month for the mortgage, around 40 percent of his salary. Hong Kong’s real estate is the most expensive in the world, with median house prices at 19.4 times median incomes — the worst ratio globally according to the Annual Demographia International Housing Affordability Survey 2018. More than 60 percent of new flats under 430 sq ft are taken up by investment buyers, according to government figures. With the ability to buy a flat increasingly out of reach for the majority of Hong Kong’s 7.4 million residents, developers are creating smaller spaces to reach a wider market. Under Hong Kong law there is no limit to how small a flat can be. Ryan Ip, senior researcher at public policy think tank Our Hong Kong Foundation, describes it as an “unhealthy” trend with developers putting profit above quality of life. But other local land research groups argue Hong Kong should develop under-utilised brownfield sites and idle government land first. The government is considering a host of options, from new artificial islands to developing the city’s cherished country parks. All tenants have access to communal facilities, from shower areas and a kitchen to activity rooms and study rooms. She now pays $5,600 per month, which she says allows her to support her parents financially and pay her sister’s tuition fees for a master’s degree — a common practice for young adults who are working. “I want to strive for an apartment, but at the moment, there’s no way for me to achieve that goal,” she explained.